Tonight and Tomorrow: Spotty showers and a rogue storm is possible this evening until about 8 PM, with clouds breaking up quickly. 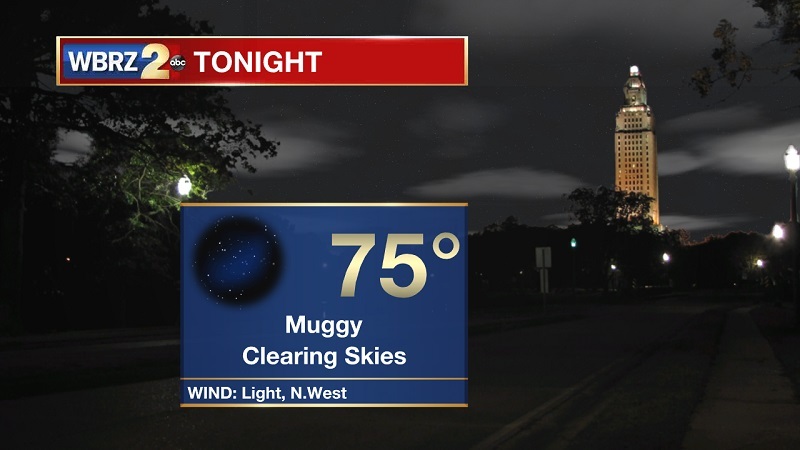 Temperatures will drop into the 70s around 1 AM, eventually reaching a low of 74° with light winds out of the northwest. The heat and sunshine will continue into Monday. Isolated showers and storms will develop around 1 PM, and stick around through 6 PM. Temperatures will reach a high near 94°, with heat index values hovering around 105° during the peak afternoon hours. Up Next: This pattern will stick around, with light, spotty, afternoon showers and storms through much of the week. The lack of clouds and rain will allow for above average high temperatures to stay in the low to mid 90s through the midweek. Showers and storms will turn more scattered by Friday and Saturday. Tropical Storm Florence is continuing to drift through South Carolina and drop a devastating amount of rain. Flash flooding and major river flooding is occurring over most of the Carolinas. 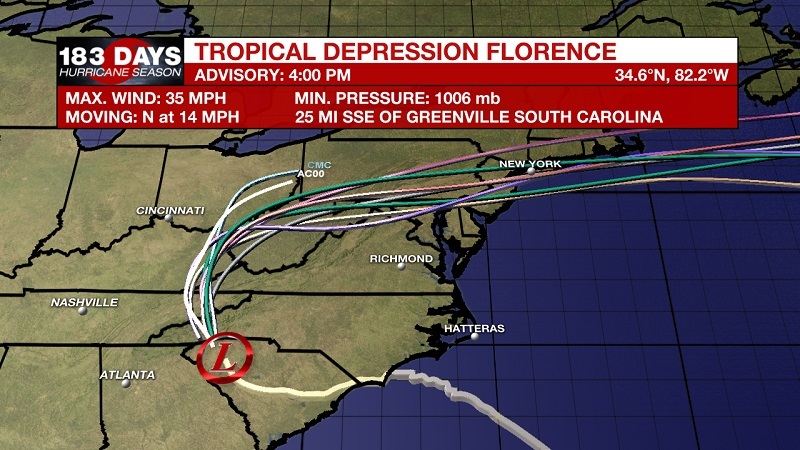 It is currently about 25 miles south-southeast of Greenville, South Carolina, and about 60 miles south-southeast of Asheville, North Carolina. Florence currently has 35 mph sustained winds, and is moving much faster at about 14 mph toward the north. This motion is expected to accelerate to the north tonight before turning eastward across Southern New England on Tuesday. Some additional weakening is expected over the next 24 hours before intensification begins on Tuesday as the system transitions into an extratropical low. Tropical storm Joyce is about 400 miles southwest of the Azores, and moving east at 17 mph with sustained winds of 35 mph. This general motion is expected to continue through tonight. After that time, the cyclone should slow down and turn toward the southeast and then the southwest away from the Azores. The National Hurricane Center has issued the final advisory on Helene that has become a Post-Tropical Cyclone over the northeastern Atlantic Ocean. We are also monitoring a broad area of low pressure, associated with the remnants of Isaac, is located about 125 miles east-southeast of Kingston, Jamaica. This system continues to produce disorganized showers and thunderstorms over the central Caribbean Sea. 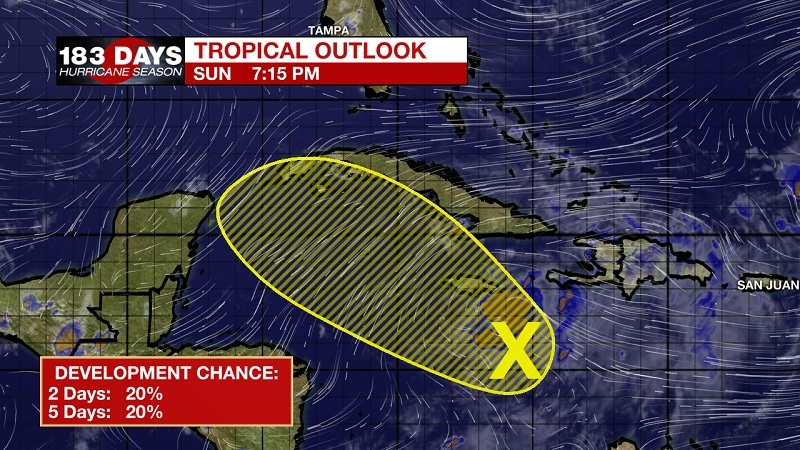 Some slow development is possible during the next day or so as it moves west-northwestward toward the northwestern Caribbean Sea. Afterwards, environmental conditions are forecast to become less conducive and re-development appears unlikely. The National Hurricane Center is suggesting only a 20% chance of tropical formation within the next 5 days. The low pressure that has moved onshore near Corpus Christi, Texas yesterday, is continuing to move inland across West Texas. This has allowed for a high pressure to develop off the coast of Galveston, Texas. 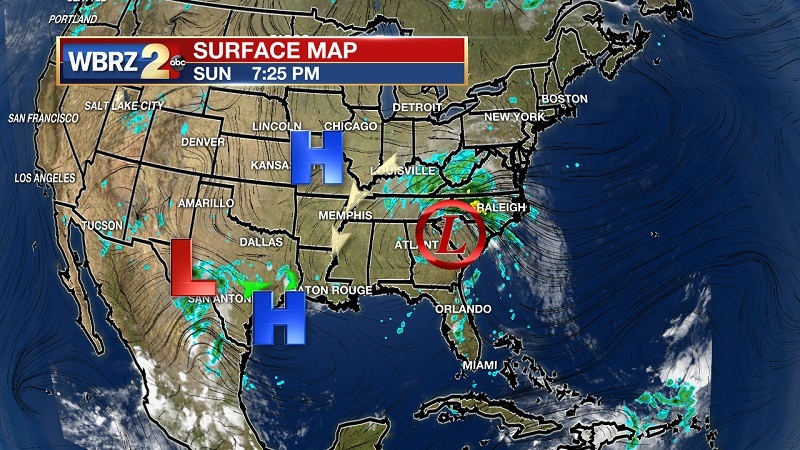 The proximity to our area, and the circulation around the high, is continuing to bring moisture and humid conditions across Louisiana and Mississippi. We are experiencing dry, northeasterly winds from the west side of Florence, but this influx of mid-level dry air will break down as Florence picks up forward speed and turns toward the northeast on Monday. This is when the high in the Gulf, will begin to build an upper level ridge over the area. The high will stay in the Gulf, which will keep moisture pushing onshore, but the sinking air associated with the high pressure will keep showers and storms on the spotty to isolated end, and confined during the afternoon hours. This ridge will eventually break down as we head through the mid-week, with rain chances set to increase by Friday to allow for scattered storms and average high temperatures. Until then, expect high to reach into the low to mid 90s, and heat index values breaking into the triple digits through the peak afternoon hours.